The London Jewellery School very rarely does discounted tuition so take advantage of this offer of 25% off day and taster classes booked between now and midnight on Tuesday 20th October 2015. You can get discount on any class you book, it doesn't have to be happening before that date. LJS have dates throughout 2015 and 2016. To obtain the discount use the code 20 09 15 01 when booking. There are so many great classes you can do from metal clay to resin, perspex to technical drawing. Have a look and see, what do you want to add to your jewellery making skills? earrings, including shaping your own earring wiresbracelets - using different materials and multi-stranded braceletsnecklaceslariatsWe will also look at design and inspiration and you will have the opportunity to work on your own projects with my support. The Mary Ward Centre is a lovely place to learn and classes are very affordable for those on a budget. The course fee includes tuition and findings (wire, stringing materials, use of tools etc). It also includes beads for the first few weeks of class. You will then be advised about the projects and be able to purchase your own beads in your own choice of colours. The class started this week with an induction but you can join on Monday 28th September and you won't have missed any techniques. A few weeks ago I was teaching the Beginners Beading class at the London Jewellery School. On that class you learn techniques to make earrings, two types of necklace and two types of bracelet. During this particular class one student asked if she could make clip on earrings as her ears weren’t pierced. 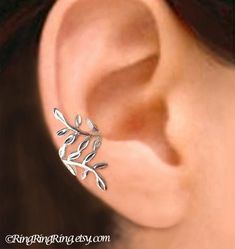 It is an unusual request as most people who attend the class have pierced ears but it got me to thinking about earring designs without piercings. We tend to think of the Pat Butcher style earring but there are some fashionable alternatives out there. I've been looking at trends in jewellery design recently and have turned my attention to jewellery for the feet! I particularly like the trend for bejewelling shoes and boots. I was listening to Gretchen Rubin's fantastic podcast Happier last week (episode 27) and was struck by this advice about decision making. When you are trying to decide on a course of action and are finding it difficult, choose the bigger life. She spoke about it in terms of deciding whether to get a dog or not. Choosing the bigger life for you could mean getting the dog because having a dog can mean more happiness and more activity. Alternatively it could mean not getting a dog because you'd have more freedom to travel, less ties to home. So the right decision for you becomes clearer. I love this idea. Whatever the decision you want to make, choose the bigger life. It was a bank holiday in England last weekend and we decided to do what we normally like to do for fun - visit a cathedral! Our favourites are the Gothic cathedrals but we are actually running out of those to visit in the UK now! Rochester isn't too far from us on the train so we decided to see what it was like. It wasn't a lovely day but we had some bright spells to enjoy the cathedral from the outside too. My partner is a photographer so I get to look at the lovely architechture and art while he takes the photos! Perfect. I have been writing some regular blog posts for the London Jewellery School on trends in jewellery design and have turned my attention to body jewellery. Worn quite regularly by Rihanna (I found lots of images of her wearing this type of chain), these are chains that are worn in some way over the torso. She tends to wear them over bare skin, a little more difficult in a British climate! However, they can also be worn over clothing.